What is scarier than launching a new business venture? Promoting it. Many successful entrepreneurs hire marketing professionals not just because it saves them significant time to focus on the core of their business, but because self-promotion doesn't come naturally to everyone (and frankly, feels awkward AF). Plagued with insecurities and "what if's", new business owners get bogged down with either wondering whether they are annoying people with marketing or... actually annoying people. So how do you get the word out without it leaving you with night tremors? This is an easy one. You've spent all these years building a friend circle across the worldwide web -- might as well use it! 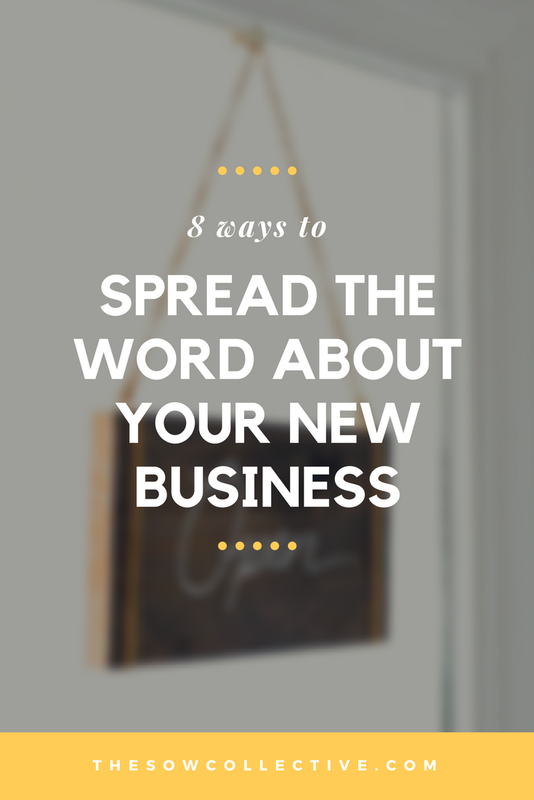 Use the contacts you already have to help you spread the word about your business. If patting yourself on the back feels too much like boasting, try alternative ways to share: ask for a vote on two logo options or offer a free perk for checking out your new website. Alternatively, you can go on Facebook live and get straight to the nitty gritty of your expertise. Answer a Q&A for your niche audience or add Instagram stories revealing your new business "behind the scenes". Don't go violating email regulations and spamming everyone, now. Send a simple email from your personal email address to a group of your friends, family, and colleagues. Announce your new business and thank them for the support far and wide -- maybe even offer a friends and family sale or reward for referrals. Then, start building your email list ASAP: invite them to subscribe to your monthly newsletter if they want to hear more about your work and the latest updates. Your newsletter is the heart of your business (second to consistent, quality content) and the key to turning fans into customers. If you haven't already joined a networking group (or three) you are missing out. From masterminds to networks and meet ups, surrounding yourself with like-minds (be it entrepreneurs or niche professionals) opens the door for recommendations and connections -- especially if you have a unique background and are known to be knowledgable, supportive, and kind. Join a meetup.com group (or create your own), purchase a membership to a professionally-led mastermind, or join a number of online forums with professionals in your industry. The Sow Collective's clubhouse, for instance, is a members-only club that fuses mastermind benefits and discount rewards, including a closed Facebook group for entrepreneurs to network and grow their business. When is the last time your audience heard about your business from someone other than you? If you're just starting out, don't feel bad if the answer is "never". The fact is our society is a referral-based one. We don't shop online unless we read a few reviews. We don't go to the doctor unless we research their reputation. We don't book a group dinner unless we've made sure it'll be tasty. Your audience wants reassurance that they aren't going to waste their money. In order to convince them, you have to get people talking about you; being a character witness on your behalf. Start Google searching your industry keywords with the word "podcast", "blog", or "magazine" to find leading voices. Reach out to editors and writers and propose an interview on topic with their brand. Sign up for a HARO (Help a Reporter Out) account and start answering inquiries. Whichever avenue you choose, build your name and tap into audiences that have already proven to be loyal: they might love your work. When's the last time you went to a happy hour, industry conference or local event? When's the last time you networked and introduced yourself, or passed along your business card? Each day that you go outside is a new opportunity to make an in-person connection. Whether you're catching quick WiFi on vacation and decide to share a passcode (later learning that person is a marketing director in search of sponsoring someone just like you -- yes, that really happened), or a random neighbor in your Airbnb elevator (who happens to own a chunk of the cloud forest in Ecuador and offers you a trip -- yep, that happened too), you just never know who is in the same room as you! Be kind, be useful, and never judge someone's worth and reach by their exterior. There is no reason why your LinkedIn should be outdated. It is the Facebook for professionals and recruiters and a top tool potential clients use to stalk -- I mean, research -- your background. Ask old colleagues to give you reviews, post your portfolio and best work, and make sure the listed dates match the resume you're sending around. Lastly, have a bright, professional headshot that matches your brand and be sure to update your tagline to communicate the job and client you WANT. If you don't have a referral program set up, you're missing out. If your clients (both old and new) don't know about your referral program, you're also missing out. Referral programs are the bread and butter of continued business (granted, your business has to be worth referring, but that's a whole 'nother conversation). Look at Google Drive, Dropbox, Airbnb, Uber, etc. They all have referral and rewards programs that grant you benefits for simply spreading the word or engaging with their product. In fact, Dropbox went from 100,000 users to 4,000,000 in just 15 months simply because of referrals. Is your program worth referring? Then give your clients a benefit they won't want to turn down and get the word out. Sometimes you need a helping hand, like access to a database of users who've specifically signed up to a service to become a paying customer. What is that service in your industry? Whether it is UpWork.com for remote administrative or design work, Lifecoachhub.com for wellness coaches, flyers, or a post in the local Yellow Pages or newspaper ad space, take advantage of directories and spread the word about your business. Have you advertised your business in a unique way and found success? Share your story in the comments below. Share this post using the image below if you found it useful!